Cincinnati, Ohio, November 2, 2018 – When considering high school athletics, most people immediately think of soccer, tennis, volleyball, basketball, or one of many other OHSAA sanctioned sports. 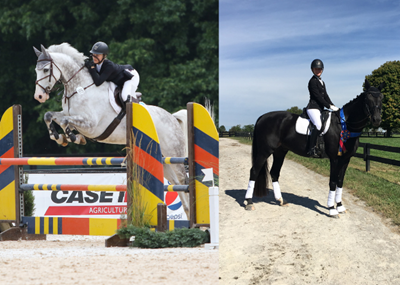 However, two Saint Ursula Academy students are making quite a name for themselves in National Equestrian events. Adeline Pavlin ’21 of Hyde Park was recently recognized by US Equestrian for her dedication and success in the US Equestrian Athlete Lettering Program. Adeline has documented over 100 hours of training during the year and has participated in numerous equestrian events around the country. She has been riding horses at Kneipp Farm in Cincinnati since she was five-years-old. She is currently competing with her horse Elliot. Bella Zdolshek ’21 of Crescent Springs, KY recently won the 3rd Level JR/YR, Region 2 Dressage Championship with her horse, Talisman One, scoring higher than riders from Illinois, Indiana, Kentucky, Michigan, Ohio, West Virginia, and Wisconsin. Dressage, a French term for “training,” requires that horses and riders display a gracefulness as the horse is directed through a series of movements, both straight and sideways. Earlier this year, Bella was also recognized for becoming the youngest United States Dressage Federation Gold Medal recipient in history, at the age of 14. Saint Ursula encourages young women to become confident leaders and we are proud of these young women who have become leaders while pursuing something they love. While many athletes at Saint Ursula play for SUA teams, there are many other student athletes competing around Greater Cincinnati on dance teams, rowing teams, and synchronized swimming teams, in addition to these two equestrian athletes. Photo caption: Saint Ursula Academy students Adeline Pavlin (left) ’21 of Hyde Park on Elliot, and Bella Zdolshek (right) ’21 of Crescent Springs on Delorean compete in equestrian events around the country.